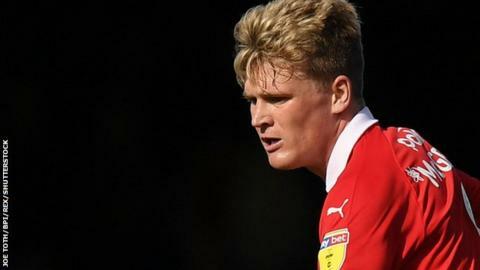 Barnsley midfielder Cameron McGeehan has been banned for three matches after being found guilty of violent conduct. The 23-year-old denied the charge after an alleged stamping incident in his side's 3-0 win at Southend. It was not spotted by officials but picked up by television cameras and an Independent Regulatory Commission found him guilty of the offence. McGeehan will miss the League One games against Accrington, Sunderland and Doncaster Rovers. Second-placed Barnsley will also be without forward Jacob Brown for those three matches after his straight red card at Roots Hall, while top scorer Kieffer Moore will miss the rest of the season on medical advice. "Barnsley Football Club are exceptionally disappointed in the decision to suspend McGeehan after the charge was denied and a clear explanation was given," a club statement read. "The club offered the view that the video evidence shows the opposition player moving whilst on the floor, when McGeehan was unable to change the course of his direction in mid-air. "There was no complaint from the opposition players, staff or the officials at the time despite it being in front of both dugouts. An apology was then instantly offered and accepted from each player involved."